Compression Set Testing measures the ability of rubber to return to its original thickness after prolonged compressive stresses at a given temperature and deflection. As a rubber material is compressed over time, it loses its ability to return to its original thickness. This loss of resiliency (memory) may reduce the capability of an elastomeric gasket, seal or cushioning pad to perform over a long period of time. The resulting permanent set that a gasket may take over time may cause a leak; or in the case of a shock isolation pad, the ability to protect an accidentally dropped unit may be compromised. Compression Set results for a material are expressed as a percentage maximum figure. The lower the percentage figure, the better the material resists permanent deformation under a given deflection and temperature range. Compression set results can be confusing in that they are calculated different ways under different methods of testing. It’s used especially to test the static compression for rubber. 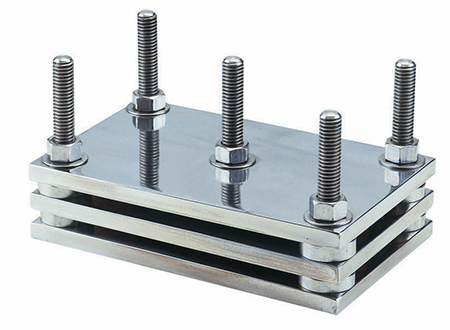 Place one standard specimen between parallel flat plates, revolve the screws then compress it a certain range of percentage and then put into the oven under the specified temperature for a certain time period then take it off cooling for 30 minutes to measure its thickness for calculating its permanent deformation rate.